Because no one is calling Be-Backs today, if you just call, you’re ahead of the game. You don’t need a great script or even a good process; you just need to pick up the phone and call them. Moreover, according to a 2014 McKinsey Study, car buyers visit just 1.6 physical lots before they buy, so calling today (the day they were here) is pretty important. Get voicemail? Leave a voicemail. Get a live person? Ask them to come back into the dealership. It’s really not that hard. In other words: Just call; we can figure out what you’re going to say later. There are a lot of car sales Be-Back scenarios, so putting together one “best” Be-Back process is not realistic. For example, if we know why they didn’t buy, then we just focus our strategy around that reason, right? The process is driven by the knowledge gained during the visit. Where we need to write and maintain a Be-Back process driven by pre-assigned activities are those instances when prospects do not provide crystal clear reasons why they did not buy. For example, if they had price objections (which could be simply masking some fear) or if they still want to “shop around,” the real reason they left may not be known to the dealership when making the Be-Back call. The dilemma facing your sales team is that if you focus on the wrong objection, you will not get them back. To drive Be-Back appointments in instances where your team doesn’t have a 100% clear reason why they did not buy today, make your first call a survey call. 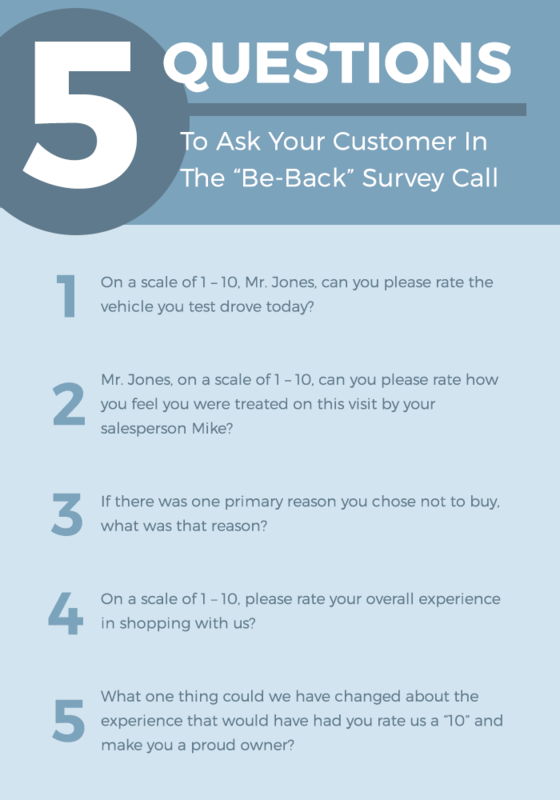 The survey call is a soft approach that disarms prospects and uncovers the path your team needs to follow to get the Be-Back to Be-Back. The survey call is always made by someone other than the respective salesperson. The idea is to uncover the real issue and if the salesperson is the issue, then the dealer stands no chance of selling this customer when the only one trying to get them back is the offending salesperson. Use a Be-Back survey call to uncover the real issue why the customer left—and don’t let the salesperson make that call. Assigning this call to someone with a pleasant voice with no “skin in the game” – perhaps a BDC agent specifically assigned to make these calls or a bored receptionist – gives you the best chance of disarming a potentially defensive or even hostile prospect. The survey call is non-confrontational and takes just a few minutes to complete. YOUR TEAM: Hi Mr. Jones, this is Mary, the Customer Experience Specialist for Steve’s Toyota. Would it be okay if I asked you a few quick questions about your visit today to help us better serve our customers in the future? It’s critical to remember that the person on your team making this call only asks questions and takes notes on the prospect’s answers. They should never try to do anything to sell the vehicle or even overcome customer objections. After the call, the agent gathers the customer’s answers and sends them to the respective sales manager. Based on the responses, the sales manager can either call the prospect directly or can give the prospect back to the salesperson to call. Of course, if the salesperson was the issue, the manager can assign the prospect to another salesperson to call. The process begins on Day 0 (the day the prospect was on your lot) if the visit ended early in the day and begins on Day 1 (the day after the visit) if the prospect left closer to closing time. Naturally, the Be-Back process stops once your salesperson or manager connects with the customer. What do they say when they connect? They address the concerns identified in the survey and then ask for the appointment. Simple enough, right? (Of course, none of this is possible if they won’t “Pick up the damn phone and actually call a Be-Back for once in their ever-loving life!”). Steve Stauning is a popular automotive industry speaker and writer, the founder of pladoogle LLC, and a proud and active board member for Dealers United. As a true workaholic, he is considered ‘hobby-less’ by most standards; though this former US Marine does enjoy boating and outdoor activities near his home in Northern Idaho. Check out his 100% free video training site for dealers at SteveStauning.com.